Zinc White in Linseed Oil | KREMER Oil Colors | Ready-made Colors | Kremer Pigments Inc. Concentrated - to be diluted, with SHELLSOL® T or turpentine. For faster drying, 1-2 % siccative can be added. 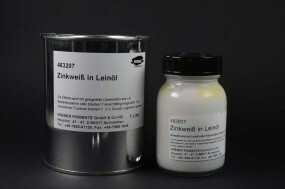 Chemical description Preparation made of linseed oil and zinc white. Customer evaluation for "Zinc White in Linseed Oil"